Spring of 1993, our last few months of living in what we called our “do the right thing” household. We were black, Italian, and Korean, living peacefully in our beautiful old craftsmen house above Fountain, in post-Rodney King Los Angeles. 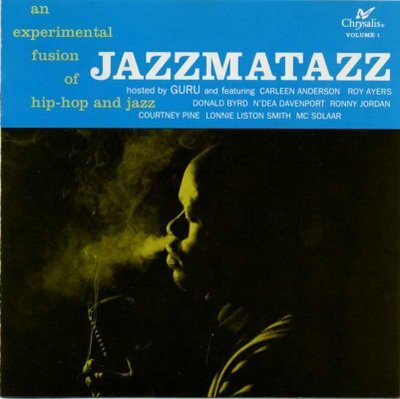 I’ll never forget the weekend Kiana’s b-boy, Seoul to Soul, ex-visited from Brooklyn and dropped Jazzmatazz on us….what!?! I was getting ready to move to New York to start my MFA at Tisch, and the sound of Guru swinging urban romance, hustle and inspiring pre-Obama audacious hope for hip hop over my life my life my life Roy Ayers made me know East Coast was gonna be just fine and a southern California jazz and warm weather fiend could always find sunshine inside Guru’s radiant rhymes. My first favorite gift of spring was receiving this image the other day from a classmate, Anna Elena…we feast every Monday on a course called Women, Folklore and Afro-Atlantic Religion taught by the fabulous Dr. Solimar Otero. When I told Anna about my sacred jazz journey I think the first thing she asked me was, “Have you been to the John Coltrane Church in San Francisco?” I became filled with the memory, nearly 20 years ago of the choir of saxophones playing “Acknowledgement” for at least an hour. What’s funny is it was probably around this time of year and raining terribly that morning but it seemed like our chanting “a love supreme, a love supreme” for that long, that centered, that sacred broke the clouds and restored the sun…I remember this so well partly because I lost/left my favorite umbrella in the sanctuary that day. 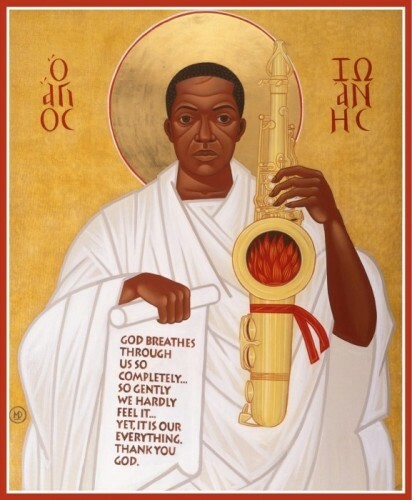 I have not been fortunate enough to return since the paintings of Mark Dukes’ astonishing Coltrane icon series have graced the sanctuary walls. (Check out SFMoma’s blog series on Dukes with Coltrane church founder, Archbishop Franzo King http://blog.sfmoma.org/2010/01/interview-with-coltrane-icon-painter-mark-dukes-and-archbishop-franzo-king/) Still the memory of being encircled by the devotional swell of that saxophone choir fills me with peace and maybe even spring this rainy night in Cambridge. 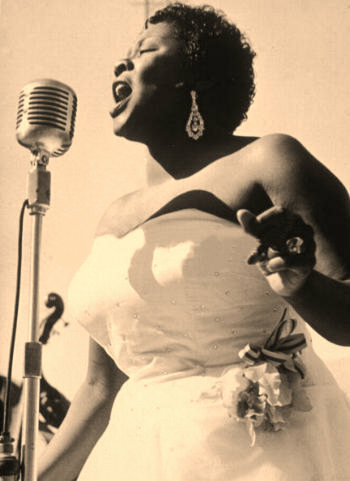 I haven’t been listening to enough Clifford “Joy Spring” Brown lately, but had a splash of Dinah Washington last night that made me think I gotta pull out Dinah Jams…please get that album immediately if you do not already own it. I can’t think of a more explosive joy between a singer and trumpet player than Dinah’s and Clifford’s, can you? Come rain or come shine? Come shine, Dinah…look at you…talk about joy spring…you might as well be Spring.